helps boost the immune system. Benefitting from the latest advances in formulating techniques, our new supplement uses liposome technology to produce a highly-absorbable form of vitamin C, also known as ascorbic acid. This innovative technique is based on the use of phospholipids in lecithin obtained from sunflowers and quality-controlled, non-hydrogenated sunflower oil. In the stomach, these phospholipids protect the vitamin C by forming tiny bubbles called liposomes, which because of their size, and the fact they are made of the same material as cell membranes, are easily absorbed by the body. This technique therefore makes the vitamin C bioavailable to many of the body’s organs. it protects blood vessel walls by contributing to arterial flexibility and healthy blood pressure. We need to obtain this essential vitamin from the diet and while it is naturally present in certain foods, intake can sometimes be inadequate. Individuals who do not eat a balanced diet, are older or who smoke are all more likely to be lacking in vitamin C, and in such cases, nutritional supplementation may be necessary to prevent deficiency. Vitamin C also offers significant therapeutic potential. It is, for example, recommended for treating temporary fatigue, boosting the immune system and preventing colds and flu-like conditions. The benefits of vitamin C are available in dietary supplements of various forms. 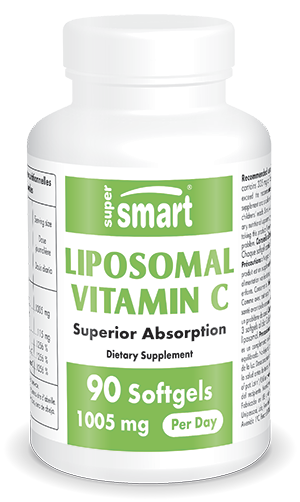 Among them is “Liposomal Vitamin C”, which with its innovative liposomal delivery system, represents the latest generation of vitamin C supplements. Highly absorbable and bio-available, this new supplement is in the form of softgels, with a suggested dose of 3 capsules a day. Daily 3® and Daily 6® are two other formulations that offer supplemental vitamin C; in fact they contain a total of 43 and 55 different nutrients respectively. Other ingredients: medium-chain triglycerides, beeswax. Quali®-C, DSM. adults. Take 3 softgels a day. Each softgel contains 335mg of liposomal vitamin C.